Create invoice/quotation screen will come into the picture whenever you make a sale or create a quotation/bid for your customers. Navigation : From main menu list, select ‘Sales’ and then click on ‘Create Invoice/Quotation’. Enter required details and then click on SUBMIT. New invoice record will be created successfully. Select Product Line : Enter the product line name on this field. To know more about product line, please have a look on ‘Create Product Line help document’. Select Branch : Please enter your sales branch if you are a multi branch company and you maintain separate sales information for each branch. For single branch company branch name will automatically appear here. Customer PO Ref. No. : If your customer has sent you a purchase order or quotation to buy material from you, then while creating the sales order please enter their PO number here as future ref. Ship To Customer Address & Pay To Customer Address : As soon as you select ship to customer name, system will auto populate both ship to and pay to addresses here. Ship to address is where your customer wants you to deliver the material and pay to address is for billing and payment. Product Description : Please enter the product name or click on to select your product from the list of product records after verifying the product image, stock availability and pricing information. Qty/Unit : Please enter the sell quantity. UM : Unit of measure field will auto populate the data as soon as you select the product. UM is defined in each product record. Unit Price : Unit price will auto populate if you have already defined it in price sheet against this product. If not then please enter the product’s per unit selling price on this field. Ext. Price : Ext. price is quantity * unit price. For an example if you have entered 5 as quantity and 100 as unit price, then system will auto populate 500 on that field. Discount % : Enter discount % on this field, system will calculate the discount on ext price. If you want to enter a discount amount directly, then please enter it on the right hand side. Sub total : sub total is ext price – discount. Data will be auto populated. Tax : You can select VAT/CST/GST option from drop down and enter the %. If you have already entered these information on product line, then you don’t have to enter anything manually on this area. S&H Charges : Please enter the sales & handling charges on this field. Rounded Off : System will do this calculation. On this field if you have any amount >=.50, then system will increase the total amount and anything <=.50 will decrease the total amount. Total : Amount which you need to charge your customer for this sales invoice. Please add terms & condition of customer if there is any. If you want to add any internal notes for your customer while generating sales invoice please type that in notes field. Shipping /Invoice date : Please select the invoice date when you are generating invoice for the customer. 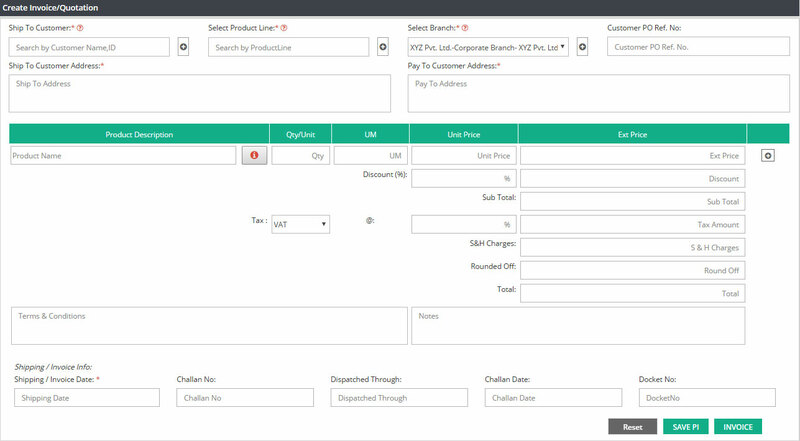 This field is mandatory while invoicing, however if you are generating sales quotation or sales order ( Not Invoiced) then this date is not required. Challan No. : Please mention the challan number for this invoice. Dispatched Through : If you want to keep a track of your shipping carrier details. Please enter the ship via name here. Like DTDC, UPS, FEDEX etc. Challan Date : Enter the challan date here. Docket No. : Please add the docket no here. Note : Select the invoice option when you are dispatching the goods to your customer and you want to generate a tax invoice copy to bill them. If you want to generate a sales bid or quotation copy for possible sales, then select SAVE PI option. This will be treated as open sales order and once you get the confirmation from customer to ship the goods, then from Manage Invoice screen you can Invoice this open sales order bid/quotation.